Chronic pain (or persistent pain) is long-term pain that lasts for more than six months. There are different types and causes of chronic pain. You may have chronic pain due to a disease or illness such as Arthritis or a syndrome such as Fibromyalgia. Alternatively, episodes of back pain, sciatica, neck pain or shoulder pain can become persistent and not resolve. Other types of chronic pain start after an injury such as a fracture or dislocation or after an operation. Normally the pain gradually goes away after the injury heals but in chronic pain the pain persists even after the injury has completely healed. In some cases, no explanation can be found for the pain – this is known as medically unexplained pain. A recent survey in the Irish Journal of Medical Science found that 13% of the Irish population has chronic pain. A larger scale survey in the European Journal of Pain showed that almost half of chronic pain sufferers had constant pain and that 19% had lost their jobs because of the pain. People with chronic pain in fact commonly experience depression, difficulty sleeping, fatigue and reduced overall ability to function both mentally and physically in everyday life. Many people with chronic pain spend a lot of their time (and money) going to appointments with a wide variety of healthcare professionals –seeking a cure for their pain and problems. Most experts agree that there is no complete cure for chronic pain (or that complete cure is extremely rare) and that therapy should be directed at ways of reducing the impact of the pain on a person’s life. There is growing research evidence for specialist treatment programmes to help people to live with chronic pain. These programmes help by teaching skills and strategies to cope with the distress and disabling effects of the pain. They involve sessions where people learn about pain and ways to control and limit pain and how to exercise safely and build up activity levels. At Evidence-Based Therapy Centre we have developed the RISE pain management programme. Having persistent pain can be very worrying and distressing. It can make you worry for the future – that things will get worse or that there is something very serious causing your pain. The first step in learning to live a better quality of life when you have chronic pain is to have a detailed clinical assessment from a clinician with specialist knowledge in this area. At Evidence-Based Therapy Centre, Chartered physiotherapists Eoin Ó Conaire Sylvia Farrell or Mark Durcan will carry out a detailed assessment and then provide a full explanation of the pain. A bespoke treatment plan can then be tailored to your individual needs. Encouragingly, research evidence shows that simply understanding your pain can reduce it and improve function and quality of life. An Australian physiotherapist and professor of neurosciences called Lorimer Moseley has published widely on the subject. In four separate clinical trials, Moseley has demonstrated that education sessions explaining the neurophysiology of pain led to changes in attitudes and beliefs about pain, improvements in functional ability and decreases in brain activity in areas of the brain associated with threat and danger. Our pain system is basically our warning system. It alerts us to danger of harm or injury. However in some cases – when pain persists after healing has occurred, this warning system remains switched on and we get persistent pain. When pain persists, the nervous system becomes more sensitive. It starts to act as if gentle movements, muscle contractions and pressure on our body are somehow dangerous to us. As time passes, it starts to take less movement to increase the pain. The good news is that a specialist physiotherapist can teach you lots of ways to help turn down the sensitivity of the nervous system. Click on the link below to view Professor Moseley’s entertaining explanation of pain physiology. When pain persists, it can affect our mood, appetite, the way we sleep and can negatively affect all of our relationships – family, friends, sexual, social and work. The biopsychosocial model of pain is the modern evidence-based way of addressing chronic pain. This takes into account not just the biological reasons for the pain but also the psychological and social components. Click on the video below to see an animated explanation of the bio-psycho-social model of pain devised by former colleagues of mine – Specialist Pain management clinicians Jackie Walumbe and Katy Bradbury. Once your chartered physiotherapist assesses you and identifies the type of pain that you have and the factors that are contributing to it, they can set about providing you with strategies to help reduce the pain and its impact on your life. Living the best possible life that you can despite having pain, requires a change in how you think about your healthcare and your life. This has been described by the American Chronic Pain Association as moving from being a patient to being a person. There are a range of skills and techniques that can help. What is probably most important is that you are realistic. For chronic pain there is no “magic bullet” that will take all of the pain away. Rather there are a number of strategies that can help. Some of the strongest evidence for the effects of pain management programmes relates to Cognitive Behavioural Therapy (CBT). This approach helps you to understand the links between what you think, how you feel emotionally, what you do in relation to the pain. This has been shown to improve mood and confidence. Cognitive Behavioural Therapy and exercise are recommended for the treatment of chronic pain in the National Institute of Clinical Excellence (NICE) guidelines and the European guidelines on the management of chronic low back pain. At Evidence-Based Therapy Centre our Clinical Psychologists – Dr. Róisín Joyce, Dr Sheila Callinan or Dr Michelle Hopkins – can take on complex cases and supervise the physiotherapists to integrate cognitive behavioural approaches in their pain management treatment programmes. Paced return to activity and exercise is of utmost importance when you have chronic pain. Often, people with chronic pain get into a “boom and bust” cycle – overdoing it when they feel good and then suffering the consequences with a flare-up of pain and having a “bust” where they hugely reduce all activity. Part of learning to manage persistent pain under the expert guidance of a specialist chartered physiotherapist is learning how to build up activity and exercise without having flare-ups of pain. How do you want your story to go? 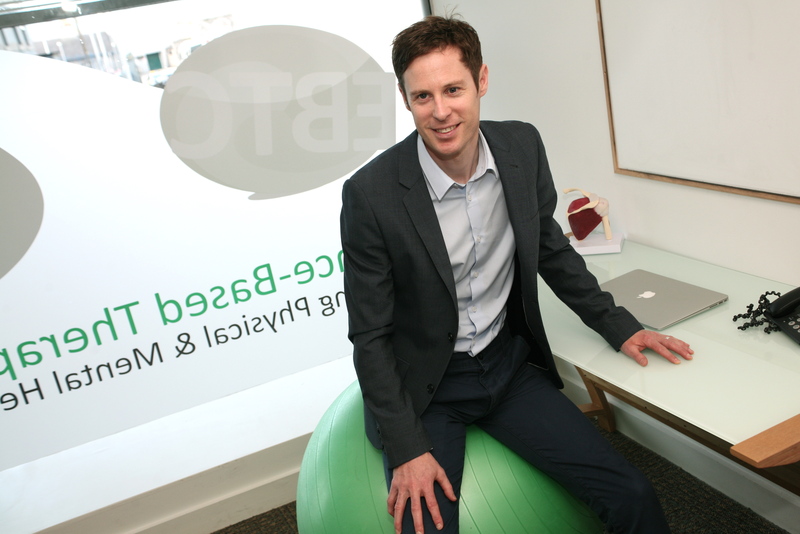 At EBTC we take an individualised approach to helping you to manage chronic pain. Before embarking on a treatment programme to help manage chronic pain, it is important that a careful and comprehensive assessment is carried out by one of our Chartered Physiotherapists. If you think that you may benefit from our approaches to pain management then please call us on the above number or contact us.